A recently published report*, conducted by the independent research company, Technavio, highlights that the global roofing market is increasing rapidly, with an estimated growth of 30% over the next 4 years. The global roofing market was valued at $79.26 billion in 2015 and is expected to reach $111 billion by 2020. The Technavio report also highlighted the popularity of roof types. In 2015, bituminous roofing accounted for a 36% market share, with metal roofing totalling 32% and tile roofing with 19%. This is expected to change by 2020, when bituminous roofing is estimated to account for almost 40% of the global roofing market. This is fantastic news for the construction market, but with the Health & Safety Executive (HSE) currently stating that working at height is the ‘biggest single cause of fatal and serious injury in the construction industry’, now is the time for this issue to be tackled, and roofing contractors are in prime position to support this change. Legislations, including the Working at Height Regulations 2005, demand that any person working at height needs to be protected to prevent them from falling. Ideally, working at height should be avoided altogether, but in many instances, it is unavoidable. When this is the case, the preferred solution is to implement a collective protection system, such as a guardrail, but sometimes this is not possible – when a building layout is inappropriate or where aesthetics may be compromised. Consequently, a personal protection solution must be implemented. Selecting the right equipment is key to reducing the risk of accidents and falls from height. From the contractor’s point of view, it’s helpful if the system selected is easy to install, available at short notice and offers good value for money. 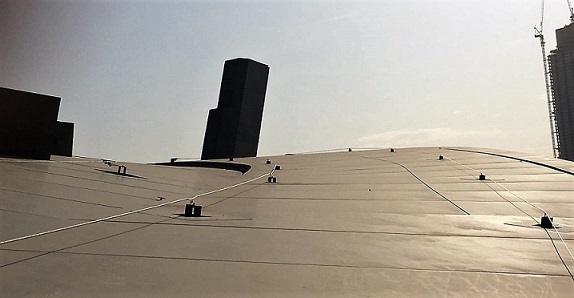 However, for the contractor to be able to take advantage of the growth within the roofing market, a safety system that is suitable for use on a range of roofing materials, and the knowledge to install this type of solution is essential. My advice to roofing contractors is to consider a wire based lifeline system that is compatible with a number of roof types, including bitumen membrane, metal profile, standing seam and composite panels. A horizontal lifeline system is a flexible, cost effective option for the protection of workers at height, especially so if the access to a roof top is an irregular occurrence. These systems provide complete and continual ‘handsfree’ protection, allowing roofing contractors to safely work on the roof and provide a virtually invisible solution to carry out repairs, maintenance or inspection work. When selecting a horizontal lifeline system, contractors should consider the number of users allowed on the system. A system that provides uninterrupted access for up to three users across the whole roof is the ideal option. Contractors should also bear in mind the installation method, whether it is rivet, clamped, bolted, chem or toggle fixed, and the weathering detail, which is important to ensure sufficient waterproofing. Consideration should also be given to external approvals, load transfer, aesthetics, maximum span and materials used to make sure the system will be corrosion resistant. Specifying this type of lifeline system presents contractors with a versatile, cost-effective and practical approach to working safely on roofs. It will help them take advantage of the opportunity within the market, but also ensure that they and their clients comply fully with the requirements of the Work at Height Regulations which has to be good news for all concerned.